Simon, a global leader in premier shopping, dining and entertainment destinations, is pleased to announce three new retailers, Fizzy Fairy Gifts, Go! Calendars, Games & Toys, and Splitting Timber Axe Range, have joined the dynamic mix at Tucson Premium Outlets just in time for the holidays! Fizzy Fairy Gifts offers fragrant, locally made bath bombs, lotions and soaps. Perfect gift giving solutions to pamper people this holiday season! Shower Steamers, Sugar Scrubs, Lip Scrubs, Foot Scrubs and more, in luxurious scents will make great stocking stuffers and gifts under the tree. The store is located on Prairie Court, across from the Gap and next to Forever 21. Where function meets fun, Go! Calendars, Games & Toys is a one stop shop for shopper’s gift giving needs! From calendars and puzzles to games and toys, this international retailer has something for everyone. The store is located on Canyon Court between Samsonite Company Store and New York & Company. When shoppers need a break from holiday stress they can blow off some steam at Splitting Timber Axe Range where participants throw axe’s at a target. Axe-perts will coach participants on safety and how to be successful at this fun pastime – think darts … but with an axe. 26 axe throwing lanes make this the largest axe-throwing range in Arizona. 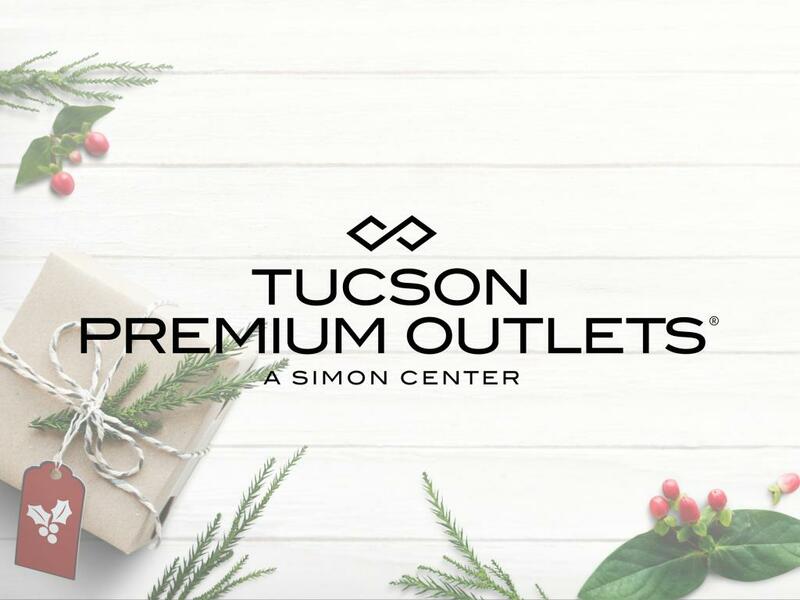 Tucson Premium Outlets is Tucson’s premier outlet shopping destination serving Southern Arizona and featuring designer and name brands at savings of 25 to 65 percent. The center is located at the intersection of I-10 and Twin Peaks Road. 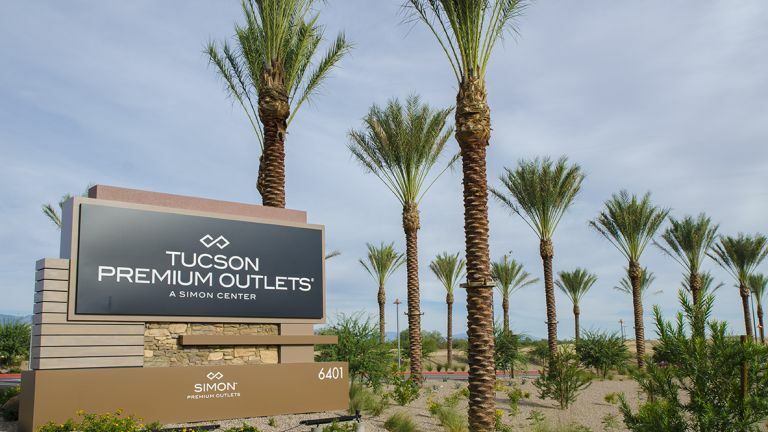 Tucson Premium Outlets features a diverse mix of retailers located in 360,000 square feet of leasable space. For more information or a list of in store promotions, please visit www.tucsonpremiumoutlets.com. Also visit the center’s Facebook and Twitter pages at www.facebook.com/tucsonpremiumoutlets and www.twitter.com/tucsonpo. The global Simon Premium Outlets portfolio offers exceptional brands at extraordinary savings through a diverse mix of luxury, designer and homeware retailers. Our 92 Simon Premium Outlets in the United States, Puerto Rico, Canada, Japan, Malaysia, Mexico and South Korea are some of the most iconic and productive shopping destinations for residents and travelers including Woodbury Common (New York City), Orlando Premium Outlets, Desert Hills (Palm Springs), Las Vegas Premium Outlets and Wrentham Village Premium Outlets (Boston). For more information visit premiumoutlets.com or follow Premium Outlets on Facebook, Twitter, Instagram and Pinterest. Simon is a global leader in retail real estate ownership, management and development and a S&P100 company (Simon Property Group, NYSE:SPG). Our industry-leading retail properties and investments across North America, Europe and Asia provide shopping experiences for millions of consumers every day and generate billions in annual sales. For more information, visit simon.com.